I rarely make cakes. My rationale behind not baking many cakes comes down to the fact that cupcakes are easier and people at work are more likely to grab a single serve dessert than slice into a cake. Believe it or not, we try not to keep too many desserts in the house and have a house rule of only eating dessert on the weekend (unless it is a special occasion). Therefore cake does not easily fit into my normal baking routine. This cake should be and was the exception as it is incredibly delicious! My sweet son had a birthday recently and we broke the rules and had dessert with all our neighbors on a weeknight to celebrate. My son loves chocolate so I knew the frosting had to be chocolate. We had Funfetti cupcakes for his birthday (recipe to be posted in the next couple weeks) and I wanted to do something different and had a feeling he would love a cake filled with Oreos. I was right. This cake is 4 layers of Vanilla Cookies and Cream Cake with Cookies and Cream Frosting between each layer and then coated in deliciously rich Chocolate Buttercream. We did not have a single slice left over! Preheat oven to 350 degrees Fahrenheit. Grease and flour two 8 inch round cake pans. In a medium bowl combine the flour, baking soda, baking powder, and salt. In a separate mixing bowl, cream the butter and sugar. Beat in the eggs, one at a time. Add the vanilla; mix well. Add the flour mixture to creamed mixture alternately with sour cream (batter will be thick). Gently fold in the Oreos. Divide batter evenly between two prepared pans. Bake for 25 - 30 minutes or until a toothpick inserted near the center comes out clean. Cool completely before removing from pan. Beat butter and cream cheese with until fluffy, 2 to 3 minutes. Slowly add sugar, 1 cup at a time. Add salt and vanilla; mix until smooth. Place Oreo cookies in a fine strainer to remove any small particles. 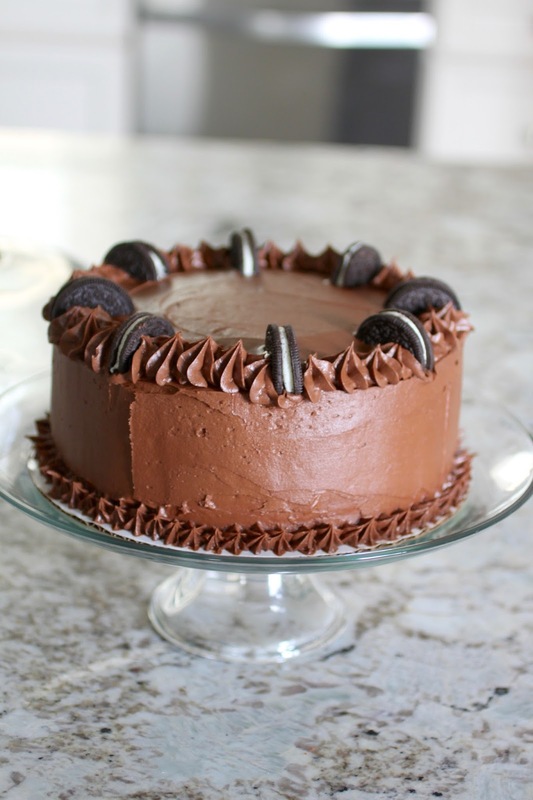 Gently stir Oreos into the frosting, careful to not over stir. Cream the butter on medium speed until it is very light in texture, add salt and vanilla. Slowly add the cocoa powder. Add the confectioner's sugar alternating with the cream until the sugar and butter are blended and you reach the desired consistency. Adjust the amount of cream as needed. To assemble cake, use a serrated knife to cut each cake into two layers. Place first layer of cake on cake board, with cut side up and add 1/3 of the Cookies and Cream Frosting. Add second cake layer with cut side down and add addition 1/3 of the Cookies and Cream Frosting. 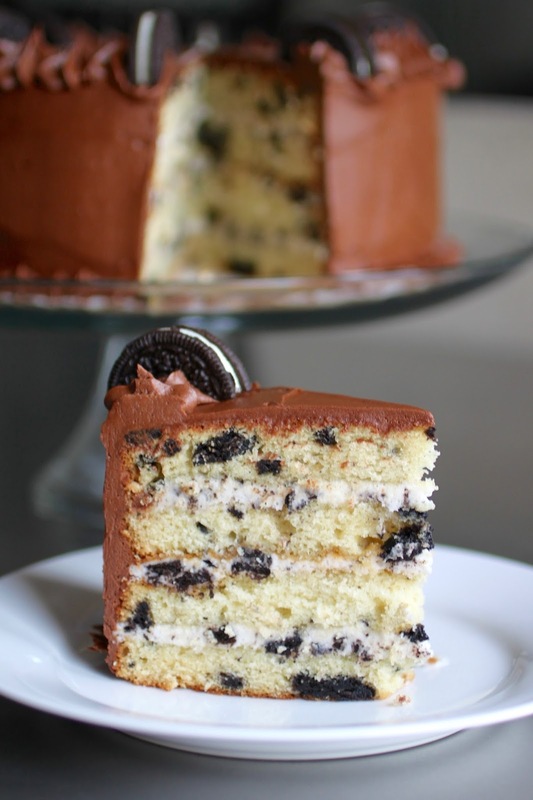 Add third cake layer with cut side up and top with last of Cookies and Cream Frosting. Top with last layer of cake, cut side down. Frost with thin layer of Chocolate Buttercream (known as crumb coat), and place in the fridge for 10-15 minutes. Frost chilled cake with remaining Chocolate Buttercream. So cute and oh so easy! I made these cookies a while back for my daughter's 2nd birthday. Like most children (and many adults), she loves sprinkles. This recipe is so simple and they are truly adorable. The recipe did not suggest making them into sandwich cookies, but since I made them so small I thought it would be nice. I used some leftover vanilla frosting from her birthday cupcakes, but chocolate, mocha, or perhaps peanut butter frosting would be a really nice addition. Add all ingredients to a bowl and mix well with a rubber spatula. If the cookie dough seems too sticky, chill in the refrigerator for about 30 minutes so it is easier to handle. 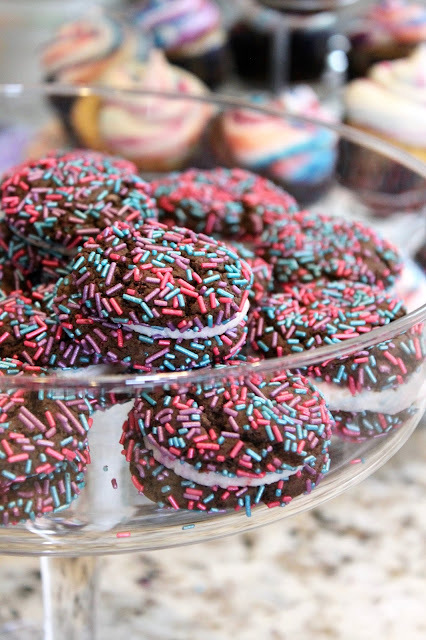 Pour some sprinkles onto a plate or into a bowl. Form dough into tablespoon-sized balls and roll in the sprinkles. Bake on a parchment paper for 10 minutes. Let cool on the sheet for another 10 minutes after removing from the oven. When completely cool apply frosting on bottom of one half the cookies and sandwich with unfrosted cookie.